A visit in Legoland Deutschland near Munich was the condition to make our children (13 and 8 years old) agree to go without a beach holiday for once and to spend our summer vacation in Bavaria instead. Schoolmates had told them about Legoland and I must admit, I also think such a family activity day out is a great experience for children. Due to the sunny weather we were not the only family attracted to the Amusement Park for children. And although we arrived quite early, we spent some time waiting at the cash desks. The management can't be blamed for that, all cash desks were open and the cashiers were doing their best. Even assistants came and pointed out the cash desks less frequently used. During the summer holidays probably all places are crowded, where children like to go. You can avoid the queues by booking your tickets online in advance. You can also profit from a range of Legoland discounts and special offers. The standard prices (Euro 37.00 for adults, Euro 33.00 for children) might have put me off, and especially my husband would have hesitated; but luckily we were prepared and everyone well informed can save a lot of money, for example with a family card for Legoland Deutschland. We could make good use of the money we had saved, because there is a vast selection of Lego bricks to choose from, so parents can buy some for their children. Legoland Deutschland is so large, we soon began to think, that it is hardly possible to see everything on just one day. Even though we arrived early and left rather late, we still missed out on some of the attractions. There is so much to see in this Amusement Park for children, you will soon notice that several days are needed to take everything in. First we took a good look at Miniland, where there are the famous miniature towns built out of Lego bricks. From the beginning our son felt drawn to those places, where he could build or try something by himself. In Legoland Deutschland it is the Imagination area. There they offer activities for girls and boys alike, and for all age groups, but I couldn't help myself from thinking that mainly young male inventors from 7-11 years old were actively engaged. Our son helped to build a skyscraper and even tried doing a robot. He really enjoyed himself, but it did upset our time schedule considerably, because our daughter preferred to go to the fun rides. Of course, every age group has its own favorite attractions in such an Amusement Park. All children above 2 years of age up to teenagers will have plenty of fun there. Therefore we decided to split up: My husband and my son were the men's team and constructors, while my daughter and I had a girls day and embarked on a voyage of discovery through Pirate Land. 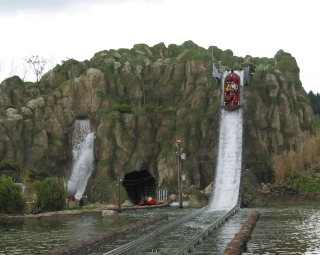 In addition to the Pirate School, there is a big swinging ship and a water slide called Jungle X-pedition. Whereas the Pirate School is especially interesting for children and early teens, even the adults were thrilled by the steep water slide. The prices for food and drinks were pleasant and did not differ from those we paid in other Bavarian locations outside of the park. That was a good thing, because an activity day makes everyone hungry and especially the kids. Some people had brought food and drink with them. I found it unnecessary to carry food around in view of the relatively low prices. But all visitors with children should also consider: A trip to Legoland draws children's attention to Lego bricks. And the park has lots of shops, which tempt children. Naturally both of our children wanted to buy something to take home with them. The Lego Star Wars, Universe, Technic, etc. do not cost more than in other toy shops, but there is a vast amount to choose from and due to the surroundings it is naturally a great temptation for every child. We grinned and bore it. The money we had saved when we purchasing our tickets was then invested into Lego, after all. And it proved to be a good idea, because with his first activities as "constructor" in Legoland and the things we bought there, it was foremost our son who got the impulse to play with something else than his PlayStation for a change. More Lego supply is on the top of his wish list for Christmas and I do prefer such gifts more than computer games. With Legoland Günzburg near Munich being too large to take in all attractions on one single day, we thought of buying a Legoland Annual Pass before we left. The Annual Pass would have cost us less, if we had shown our day tickets at the desk. But in the end we decided against it, because my husband couldn't plan his annual leave for 2012 as yet. If you would like to offer your children something special and are able to make plans in advance, it certainly is a rewarding option. Legoland Günzburg is located about 100km (60miles) west of Munich. If you have a rental car it takes about 1 hour on the Autobahn A8 in direction to Stuttgart. Once you're near Günzburg, just follow the signs to Legoland Deutschland. If you prefer to take a train, you can save a lot by using the Bayernticket from Munich to Günzburg train station and then travelling with the Shuttle Bus directly to Legoland. The shuttle bus departs every 30 minutes during high season.